Earlier this week, we ran a story about a man who alleges that his Tesla Model S drove itself into the back of a parked truck trailer, all on its own. Not surprisingly, Tesla didn’t think this was a triumph of automation, and maintains the crash was caused by user error—but I think Tesla’s user interface might be part of the problem too. 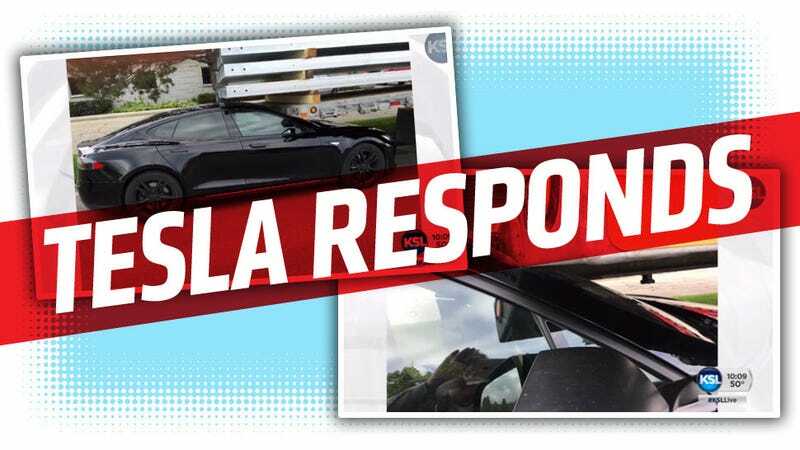 A Tesla spokeswoman told Jalopnik said she felt that the Utah TV station that reported the story was sensationalizing it, and she’s probably not wrong there, at least to some degree. Tesla does have full logs of the event, and it says those logs prove the incident was the result of driver error. In short, Tesla claims that the Summon feature still requires human supervision and control, and it told the owner that logs indicate he activated Summon himself and then didn’t disable it when he should have—leading to the crash. This feature will park Model S while the driver is outside the vehicle. Please note that the vehicle may not detect certain obstacles, including those that are very narrow (e.g., bikes), lower than the fascia, or hanging from the ceiling. As such, Summon requires that you continually monitor your vehicle’s movement and surroundings while it is in progress and that you remain prepared to stop the vehicle at any time using your key fob or mobile app or by pressing any door handle. You must maintain control and responsibility for your vehicle when using this feature and should only use it on private property. Tesla has made clear that the Summon feature requires the driver to continually monitor the vehicle and remain in control at all times, and that it “is the driver’s responsibility to use this feature safely, responsibly, and as intended.” Additionally, you explicitly acknowledged your understanding of the double-press automatic Summon initiation when you clicked “Yes” on the center touchscreen display to the question “Do you want to disable Continuous Press?” and the detailed explanation of this feature when you disabled the Continuous Press mode. This explanation included both an explanation of the double-press feature and how to cancel or stop it, and that you remained responsible for the vehicle at all times (“When you disable Continuous Press, you can double-press the Park button at the end of the gear selector to automatically initiate Autopark after you exit the vehicle and close the door... Disabling Continuous Press does NOT alleviate the user of responsibility to carefully monitor and be prepared to stop the vehicle at any time. The vehicle can be stopped with a single press of the key fob or with a single tap on the Tesla mobile app or by pressing on any door handle on the car.”) The same explanation was available at all times thereafter in the information (“i”) button of the Require Continuous Press switch in the customized settings for Summon in the center touchscreen display. In your conversation with Tesla personnel, you stated that you were fully aware of Autopark and Summon, and that double-pressing the Park button activates it. [...] The vehicle logs confirm that the automatic Summon feature was initiated by a double-press of the gear selector stalk button, shifting from Drive to Park and requesting Summon activation. The driver was alerted of the Summon activation with an audible chime and a pop-up message on the center touchscreen display. At this time, the driver had the opportunity to cancel the action by pressing CANCEL on the center touchscreen display; however, the CANCEL button was not clicked by the driver. In the next second, the brake pedal was released and two seconds later, the driver exited the vehicle. Three seconds after that, the driver’s door was closed, and another three seconds later, Summon activated pursuant to the driver’s double-press activation request. Approximately five minutes, sixteen seconds after Summon activated, the vehicle’s driver’s-side front door was opened again. The vehicle’s behavior was the result of the driver’s own actions and as you were informed through multiple sources regarding the Summon feature, the driver is always responsible for the safe operation and for maintaining proper control of the vehicle. Now, Tesla has the log data from the car, and let’s say we agree with all of it. Let’s say, for the sake of argument, that the owner was not telling the truth, and the car began to drive under summon mode within three seconds. That would mean that yes, the owner was not honest about what happened, but, even with all of Tesla’s caveats and warnings, that doesn’t mean Tesla is blameless here. I hardly think the man’s end goal was to ram his car’s windshield into the front of a trailer (the front, of course, lacks a Mansfield Bar), which would suggest that while, yes, his actions caused this, there may be a reason why he took those actions. The driver was alerted of the Summon activation with an audible chime and a pop-up message on the center touchscreen display. At this time, the driver had the opportunity to cancel the action by pressing CANCEL on the center touchscreen display; however, the CANCEL button was not clicked by the driver. ... which leads me to wonder something. If the Summon mode, which initiates unmanned, autonomous driving, might need to have a positive “Do It” button as well as a “Cancel” button. As it stands now, Summon and Autopark, when engaged, just have a cancel button on the screen, and are activated when the driver leaves the car. Since leaving the car is an action a person may want to do whether or not they decide to have the car then drive itself, it seems like accidents like this could be avoided by not having the car default to drive unmanned if there’s no action taken on the touch screen. Perhaps the owner of the car just showed the guy he was talking to the Autopark screen; he may have then just left the car, not realizing that doing nothing would set the process in motion. If there was an OK or similar button, confirming that the driver wanted the car to move on its own, this wouldn’t be an issue. If no button was pressed, the system would default to do nothing, the safest bet. As it stands now, with no activity on the screen the system defaults to drive unmanned, which has caused at least one wreck so far. So, sure, I’ll agree with Tesla that this looks like driver error. But it also looks like an opportunity to improve their UI design here, and I hope they take advantage of this chance.